The rabies virus is one of the most deadly viruses affecting both human and animal populations today. Every year, there are 60,000 deaths attributed to rabies, but global health experts believe that the actual number of fatalities is much higher. The U.S. Centers for Disease Control and Prevention has found that virus’s mortality rate is vastly underreported because most deaths occur in countries that do not have rabies surveillance programs, adequate public health resources or access to preventative treatment. Despite the threat that it poses to humans and animals, underreporting has made it difficult for the global health community to mobilize resources to find new ways to fight the virus. According to the World Health Organization (WHO), rabies is a neglected zoonotic disease that is transmitted to humans when a rabid animal’s saliva enters the nervous system through either bites or scratches. A person who has been exposed to rabies, must receive the vaccine immediately to prevent the virus from spreading. The good news is that rabies fatalities are 100% preventable. The WHO has confirmed that a patient who receives post-exposure vaccination, proper wound treatment, and rabies immunoglobulin can recover completely. Unfortunately, rabies disproportionately affects poor, low-resource communities where human vaccines and immunoglobulin are difficult to obtain. The WHO estimates that the highest incidence is in Africa and Asia, where rabies threatens up to 3 billion people. WHO data indicate that the average cost of the post-exposure vaccine is US$ 40 in Africa and US$ 49 in Asia while the average daily income in these areas is only about US$ 1–2 per person. Once symptoms appear, rabies is almost always fatal. Four out of every ten deaths are children under the age of 15. 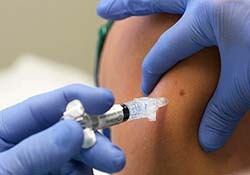 Scientists at University of Georgia’s College of Veterinary Medicine have discovered a new treatment that may extend the cutoff point for post-exposure vaccination. Infectious Disease professor Biao He and his colleagues created a new vaccine by injecting a protein from rabies virus into parainfluenza virus 5 (PIV5) sample. PIV5 is harmless to humans but still enables the body to develop antibodies that provide protection against the rabies virus. Aside from new treatment, inter-sectoral collaboration may be just as crucial to lowering the number of deaths caused by rabies. A report recently released by the WHO and the Gates Foundation highlighted how the response to rabies was hampered in some areas due to a lack of financial resources, political commitment, and cooperation between different sectors. The leaders of animal health organizations agree, but emphasize the crucial need for more funds to control rabies. On February 9th, 2015, the American Veterinary Association, Canadian Veterinary Association, and the Federation of Veterinarians in Europe released a statement recognizing that canine rabies in particular presents a serious public health risk worldwide and called for more support to be directed to mass vaccination campaigns among canine populations, which are the most cost-effective, reliable and humane way to contain the virus. Experts from the World Organisation for Animal Health previously determined that the support allocated to global rabies control was insufficient. The lack of investment in rabies control caught the attention of the BBC, which published an article that explained how this ‘invisible killer’ could be eliminated for one tenth of the cost of treating patients through mass veterinary vaccination campaigns.